Pat went on to say that he can't wait to "put my toes in the sand and forget about Raleigh for awhile." Last week, he submitted the first application for tram operator that Hyde County Transit has received. The position has not been officially posted yet, but Pat's getting his foot in the door early. "I know the tram has its detractors on Ocracoke," he said. "But that's why I'm perfect for the job. I have plenty of experience in pushing through unpopular legislation and spending decisions. I also like going round and round without ever getting anywhere." "We think he'll do great in the position of tram operator," said county manager Bill Rich. 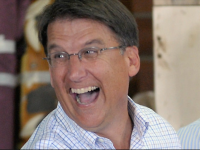 "Governor McCrory is a real people person and has plenty of experience pressing the flesh, kissing babies, and catering to a mostly rich, white clientele." Pat is also looking for interim work before the trams begin operating in 2018. He put in an application for Ocracoke restroom monitor, a position that has remained unfilled since it was created a year ago. Parts of this article are blatantly borrowed/plagiarized from a March 13th article in the Raleigh News and Observer. Sad to say, Pat will probably stay away from the island that voted overwhelmingly for the other guy. Thanks, dear Ocracoke Current readers, for indulging us on the most fun newsday of the whole year!